My wife and I left our first child at college this weekend. We’re not alone – thousands of parents will do the same thing in the coming months, and millions more have done it before us – but it feels like we’re alone. It especially felt like that on the eight-hour drive back. Eighteen and a half years ago, we brought a newborn home from the hospital. We felt alone then too. Though we had months to prepare, it was like we were called to the stage to deliver an important speech, and we had nothing to say. Diapers, bottles, teething – sometimes my wife and I would look at each other with helpless stares, hoping the other had a magic solution. It was too chaotic to ponder the future back then. Our biggest goal was a good night’s sleep. As the days and years passed, we enjoyed guiding this little brown-haired boy toward his destiny – whatever that was. We were still young and trying to find our own destinies, but we had so much hope for his. Like all parents, we wanted to open up his world, and to help him find and develop his strengths. We weren’t trained for this stage any better than we were trained for the sleepless nights, but we learned on the job and made many mistakes along the way. There were days when our home was closer to a bad MTV reality show than The Waltons or some other idyllic family-based drama, but those days were few and far between. We emphasized love and appreciation for each other, and you can kill a lot of demons that way. We just had to remember love and appreciation when frustration and anger became overwhelming. Again, most days, we were successful. Even if we lost a day, we were usually able to recover the next. As he found his path, we slowly circled behind him and started pushing more than pulling him along that path. Eventually, pushing turned into gentle prodding, and before long, we hardly needed to do that any more. He knew where he was going and had a general idea of how to get there. That’s when bittersweet reality set in – we had worked ourselves out of our most cherished and rewarding job. I wasn’t ready to turn in my keys on that job, but I had no choice. It was time to go. 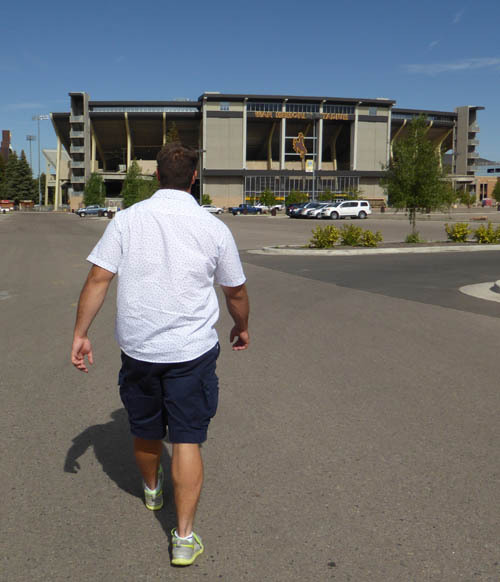 As Laramie faded in my rearview mirror, I thought about that trip home with a newborn back in 1998. None of us slept a wink that night, and we felt completely incompetent as parents. I wasn’t sure if I could do 18 days back then, let alone 18 years. We’ve come a long way since then, but now, just as I start to feel like I have a pretty good grip on parenthood, I must learn something new. I have to learn to parent at a distance and only when needed. I have to learn to focus on the tremendous opportunities and bright future that I believe lies ahead for him, rather than the loneliness of the empty spot at the dinner table. I have to learn to stifle my urge to pry and prod, and instead rely on my faith that God is watching over him and that he’s prepared for life’s challenges. None of this feels natural now, just like it didn’t feel natural to hold a screaming newborn 18 years ago, but I learned how to adapt then, and I’ll do the same now.